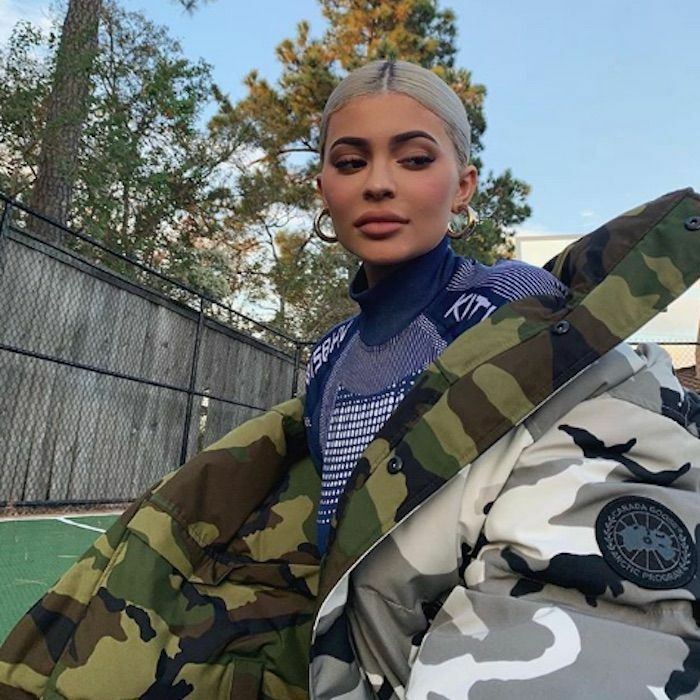 Kylie Jenner, queen of hair transformations, has switched up her color yet again. This time, it's a silvery platinum shade with dark contrasting roots that hug her scalp. This exact hair color combination happens to be the top-trending one on Pinterest, and it's not hard to see why. First, it's the closest thing we have to a universally flattering hair color. No matter what your natural shade or skin tone is, platinum is sure to suit it. Second, the color is cool, icy, and edgy, just like winter itself, which might explain why it's so popular right now on the cusp of the cold-weather season. The only downside to dyeing your hair platinum blonde is the potential damage. Taking your hair this light can result in major breakage, split ends, rough texture, and more. That's why you need to come prepared with the right aftercare products. The one Jenner swears by is only $12, and it's available at Target. Keep scrolling to see which hair treatment she counts on to keep her strands soft, strong, and shiny. This brand's hair treatments have been on our radar for a while now, ever since Jenner's older sister Kim Kardashian West first dyed her hair platinum and shared her love of a similar version on social media. Her Nexxus treatment of choice was the Emergencée Treatment ($19). Now that another member of the Kardashian-Jenner family has also vouched for the brand, we have even more reason to try it out for ourselves. Like we said before, Jenner and her famous sisters switch up their hair color often, so a healthy hair recommendation means a little bit extra when it comes from them. Jenner took to her Instagram Stories to share the haircare love with her 119 million followers. She posted a video of herself using the product yesterday, saying, "As you guys know, I bleached my hair completely and went platinum which is really, really damaging. But I have been using the Nexxus Keraphix treatment every week and this has really helped me. If any of you are thinking of bleaching your hair, my hair feels really, really good." According to the brand, hair is made up of over 90% protein. Color processing depletes this, and that is what's to blame for post-dye damage. 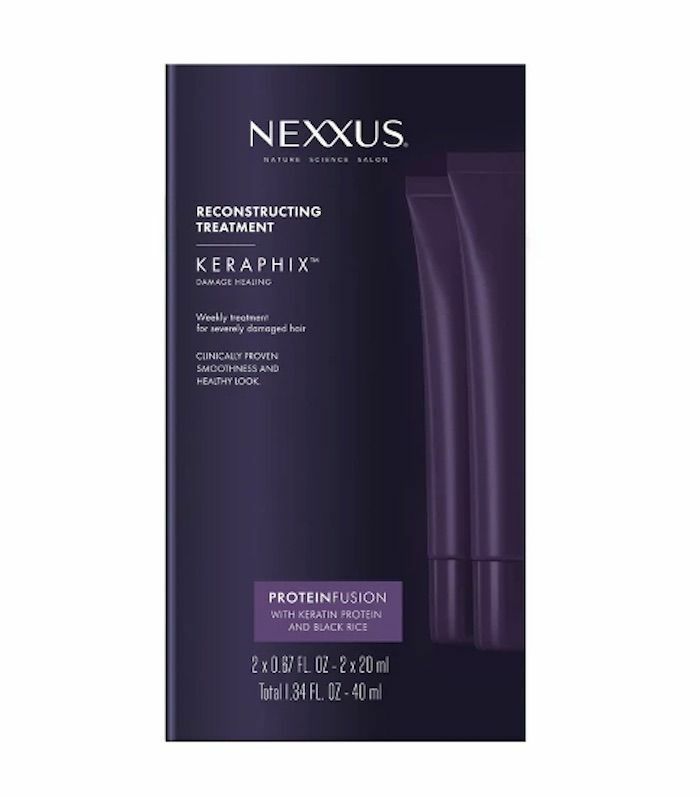 This treatment uses keratin, collagen, and elastin, along with black rice to strengthen each strand of hair from within, replenishing what might have been lost due to a color session (or many color sessions if you regularly bleach your hair). What's more is that this treatment marks the brand's most potent blend of protein to date. A single treatment contains an amount equivalent to that which is lost from damaged hair over the course of a year. It's no wonder Jenner is a fan of it. Use it weekly to restore your overprocessed hair to its former glory. All it takes is five minutes to work its magic. 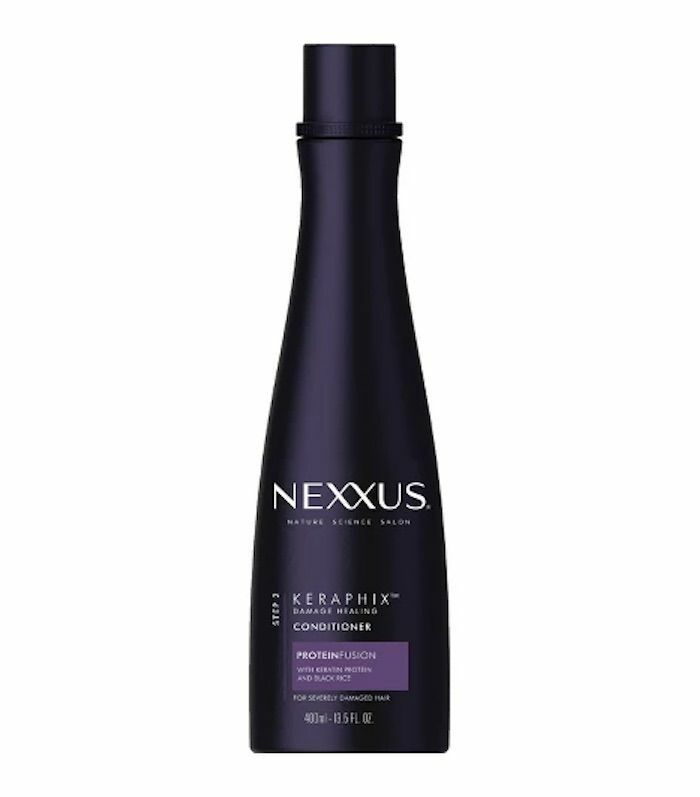 For best results, use it alongside the brand's shampoo and conditioner. Next, check out our 15 favorite Kylie Cosmetics products to shop in celebration of the brand becoming available at Ulta stores nationwide.